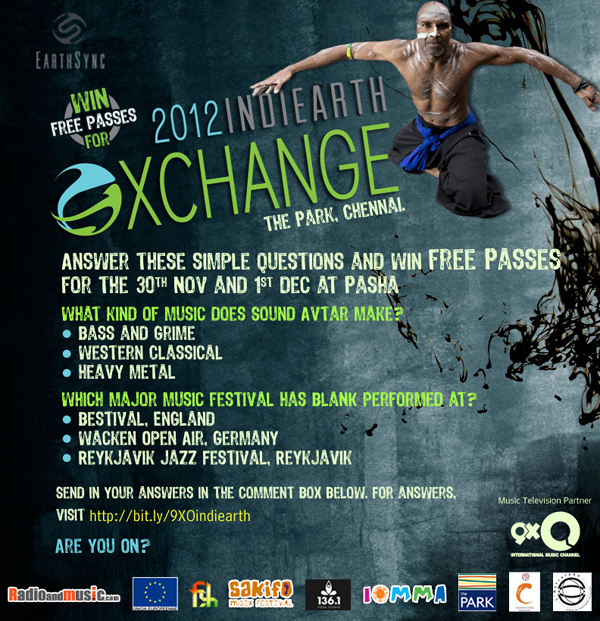 IndiEarth and 9XO – International Music Channel have partnered to float a contest on the platform to give out free passes for the club nights during IndiEarth XChange. Interested electronic music lovers have to answer two simple questions to win 2 free passes every night to Electro Deep House movers BLANK and ethno Dubstep/ Drum ‘n’ Bass slammer Sound Avtar. Between 30th Nov – 2nd Dec, IndiEarth will conduct for the first time in India, Think Tank Sessions for global exchange, collaboration and opportunities for artists and professionals, with a focus on India and the Indian Ocean region, Europe and Australia – around 11 countries in all. More than 22 international and Indian acts will present musical showcases and 11 indie films to be screened during the Xchange. The IndiEarth Project is a growing collective of artists and multi-country professionals joining hands to walk new paths in a fast changing landscape of the music industry. Looking Back: Was 2012 good for Indie music?